Hannelore Foerster/Getty ImagesOliver Samwer, CEO of Rocket Internet, celebrate the launch of the company’s initial public offering (IPO) of shares on the Frankfurt Stock Exchange, on October 2, 2014 in Frankfurt am Main, Germany. Oliver Samwer, the CEO and cofounder of German startup incubator Rocket Internet, told a conference in Berlin on Wednesday that he rarely checks the company’s stock price. 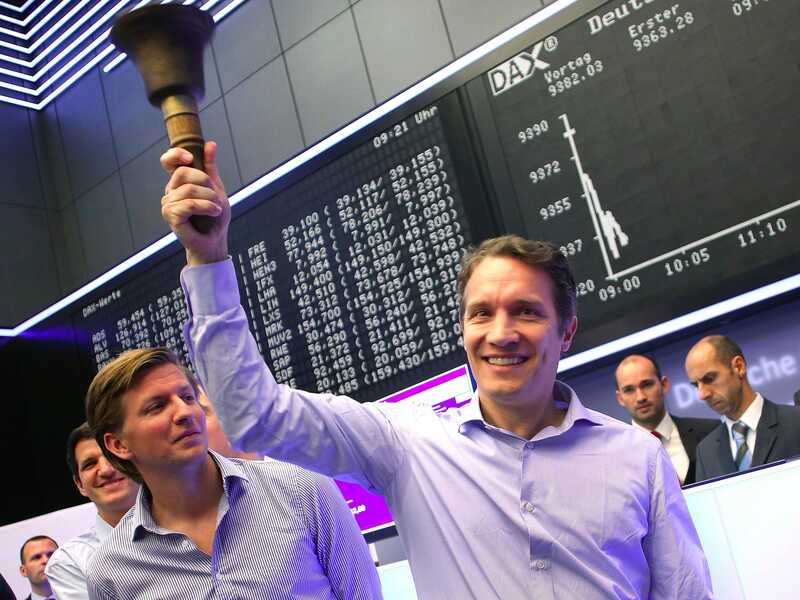 Rocket Internet’s IPO in October 2014 saw it valued at €6.5 billion (around £4.6 billion, $8.2 billion.) But the startup factory has seen its share price dive on multiple occasions since it has been a public company. Last month, the Berlin-founded company, which has backed food delivery startups like Hello Fresh and Delivery Hero, saw its share price drop when a quarterly report on its key portfolio companies failed to convince investors its strategy is paying off. You know, for us, it’s all fine because basically no we didn’t sell any shares. I think what you learn is that you have to live a life with the public market share price changing every day. But you only look at it maybe every two weeks, when you get bored at the weekend or something. The rest of the time, focus on delivering a great return, building a great company, making the right choice on investments. The laissez-faire approach is at odds with CEOs at many of the world’s largest companies, who will likely admit to checking the company’s stock price several times a day. I think the key focus of us now is to invest in young companies. This year alone we’ve probably done over 25 investments already. We’ve invested in young companies from Germany, the UK, France, Spain, Eastern Europe, a little bit in America and Asia. Samwer’s comments were made a day before a Rocket Internet shareholder meeting. At the meeting, shareholders reportedly grilled Samwer about the company’s share price, which has fallen 52% in the past year, and why its portfolio companies aren’t IPO’ing.